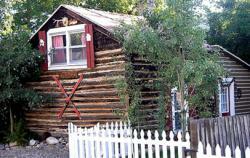 Imagine the lives of the miner's family who built this cabin in the 1880s while you enjoy the conveniences of today. This restored two-room cabin has a loft bedroom. Enjoy the TV/VCR with cable, full kitchen and gas grill, hand-stitched quilts, and 3/4 bath. After a day of fun in the Northern Rockies relax in the outdoor hot tub. Only two blocks from downtown Red Lodge with dining and shopping. Private yard and parking. Directions: The Little Cabin is located at 219 1/2 South Haggin. Turn east on 14th off Broadway (Main Street), through the Platt intersection and north behind Willows Inn.